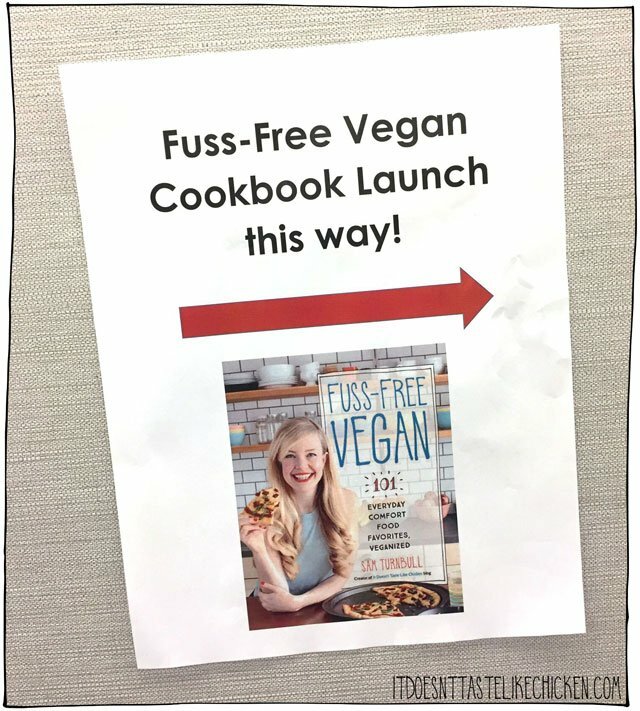 Just 2 days until Fuss-Free Vegan is here! I can’t even describe to you how I feel right now, but let me try. It’s a combination of sheer joy and I think I’m gonna puke nerves galore. I can’t wait for you to have your very own copy and to see what you think! It’s been an immense amount of work, but I loved every bit of it. I feel like I didn’t just write any book, but I created a book that represents me to the core. I think you’ll know what I mean once you get your hands on a copy. 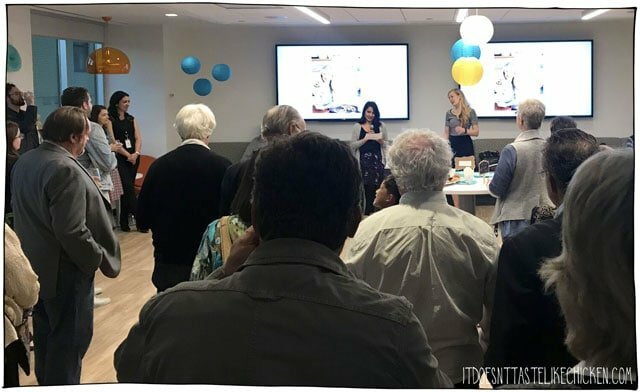 This past week I was lucky enough to celebrate it with a book launch party held at the Penguin Random House office for friends, family, and fans. It was sheer delight. 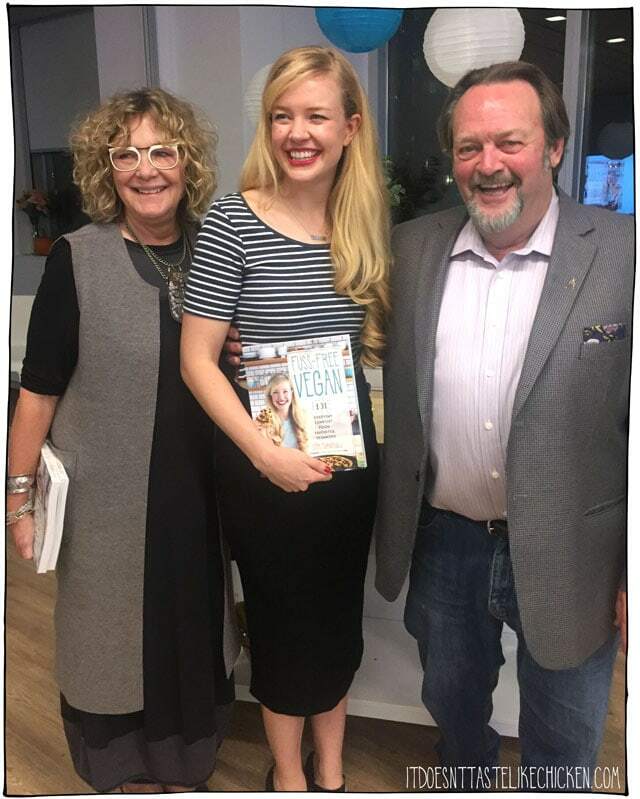 It’s so overwhelming to walk down the hall on the way to my own book launch party and pass the books of authors such as Dan Brown, Tom Hanks, Lynn Crawford, Julia Child, Nigella Lawson, Curtis Stone, Paul Hawkins, and Margaret Atwood, just to name a few. To know my book is going to be sitting on that same shelf in just a few days is just so surreal! 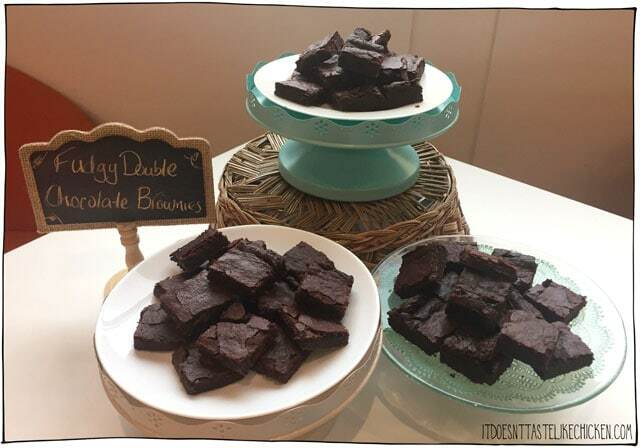 Once at the party, everyone got to sample some recipes from my book including this beyond huge Crowd-Pleasing Jalapeno Cheese Ball, mini All Hail Caesar Salads, Fall-In-Love Beet & Carrot Lox and my Fudgy Double Chocolate Brownies. 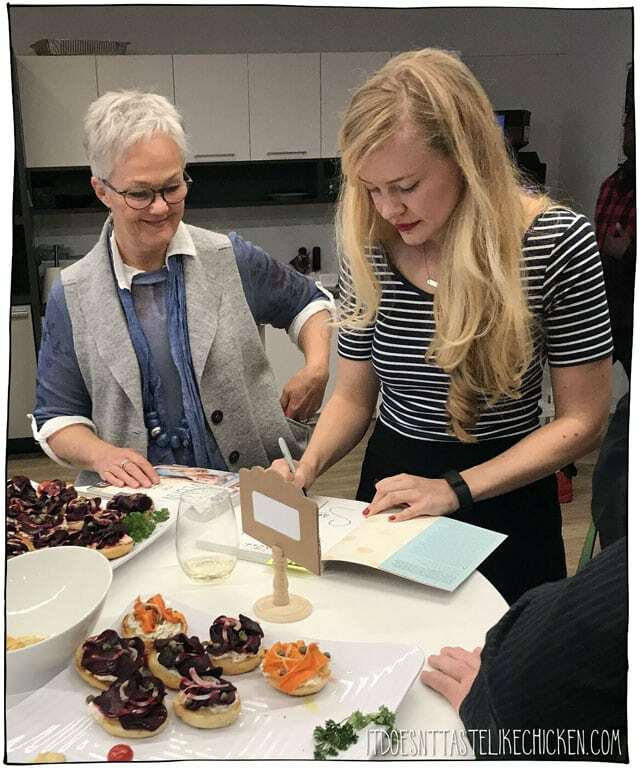 There was a lot of book signing that night, and you can see me concentrating very seriously while my aunt Nancy is grinning beside me. Now can I tell you guys a horror story? Aleks, I will never forget how to spell your name now! I’m so sorry. At least I drew you a chicken? Later in the eve, my editor, Bhavna gave the MOST touching speech. I’m seriously the luckiest person ever, to have had Bhavna select my book proposal and want to work with me. After Bhavna’s speech, I too said a few words and thank you’s. I don’t really remember what I said, but I know there were some laughs, and my speech brought tears to a few eyes. (I’m looking at you, Dad). The end of the night finished with a few poses for pictures. I just love this pic with me and my very proud parents. 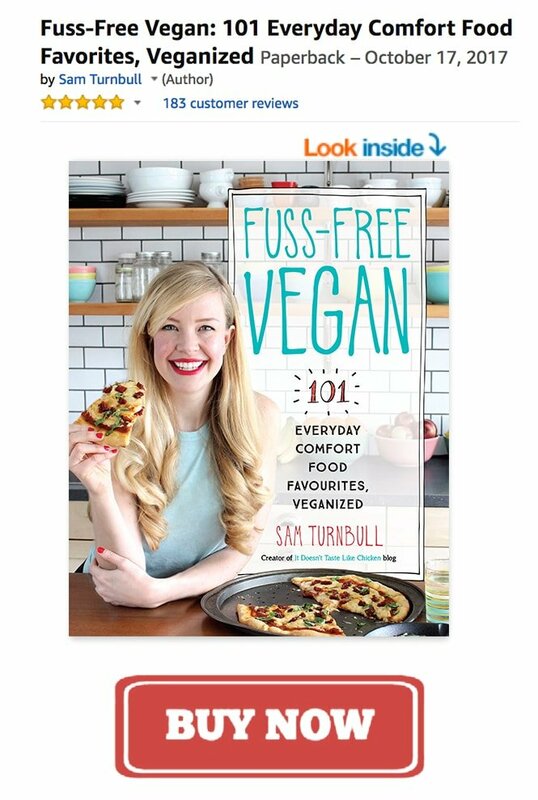 Not kidding, I just got a group email from my mom who signed off as “Mom of author Sam Turnbull (Fuss-Free Vegan)”. I have to thank my publicist, Trish so very much for putting together such a warm, generous, totally amazing party. I truly felt like a star for the night! …But the party for me continues, as Trish has also booked me all over the place. 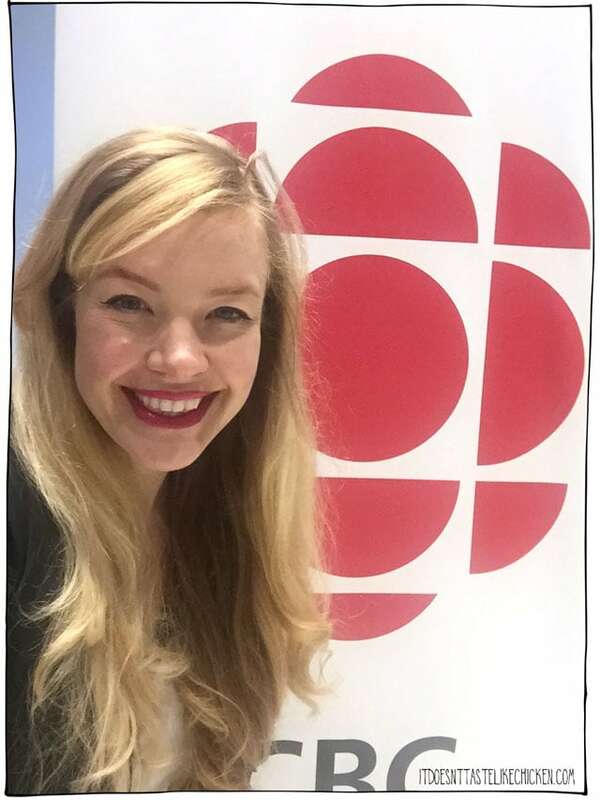 Coming up, I have a TON of radio interviews, morning shows on TV, news interviews, cooking demos, and who knows what else! I can’t even believe how full my schedule is right now. I will be sharing the interviews on my Facebook and Instagram so be sure to follow me there for more. I’ve already got my first one in the bag! 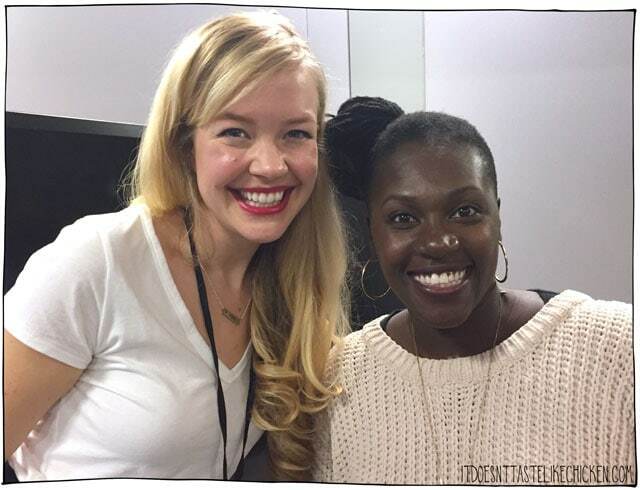 This morning I had my first radio interview with Nana Aba Duncan from CBC’s Fresh Air. You can listen to it here. I’m going to do my best to post recipes to my blog twice a week as usual, but please forgive me in advance if I miss a day or two over this next several weeks, as I will be bouncing from place to place. Hopefully, Fuss-Free Vegan should keep you occupied in the meantime! 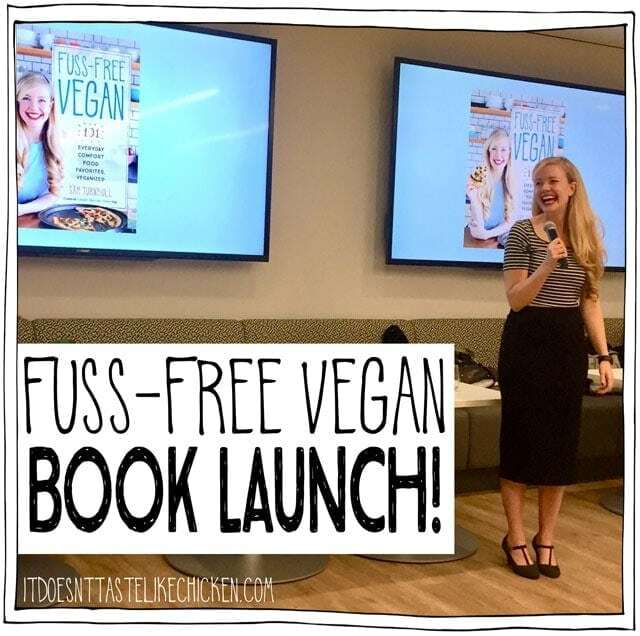 *Don’t forget to claim your free gift for pre-ordering Fuss-Free Vegan. This offer will end on October 17th and you will no longer be able to get these 7 bonus recipes (including coconut cream pie), so go get it now while you still can. Now get excited about Wednesday’s celebratory recipe. Hint: it’s boozy, it’s baked, and there’s frosting. Omnonom! Special thanks to Mom, Dad, Gretty, Ben Murray, Arlene Cohen, and Julie Danaylov for letting me steal their photos from the night. I received my long awaited copy of Fuss Free Vegan and last night tried the Bolognese on a 50/50 blend of pasta & zoodles. Delicious! The best thing is it truly was fuss-free! It took way longer to cook the hubs traditional meat sauce and spaghetti than it did my vegan one. Thank you, thank you! I see this being my go to cookbook when I’m pressed for time. I received, my copy, of your cookbook last week. I had a chance to sit down and look through it. I was not disappointed! I cannot wait to try some of the new recipes. Thank you for the “real” food recipes! Sam, we need a thread to comment on your cookbook! I commented on Amazon, but I Have been sampling recipes and I want to let you know they are delicious! Today I made the burrito bowl and the seasonings for the beans and the ranch dressing were amazing! What size bowl do you use? I ended up arranging on a plate because none of my bowls were deep enough to do it justice. Made a great tailgate meal. And we loved the heart of palm and the chickpea sandwich spreads. Also, LOVE the flaps on the book, makes it so much it easier to use. Thanks! Thanks! 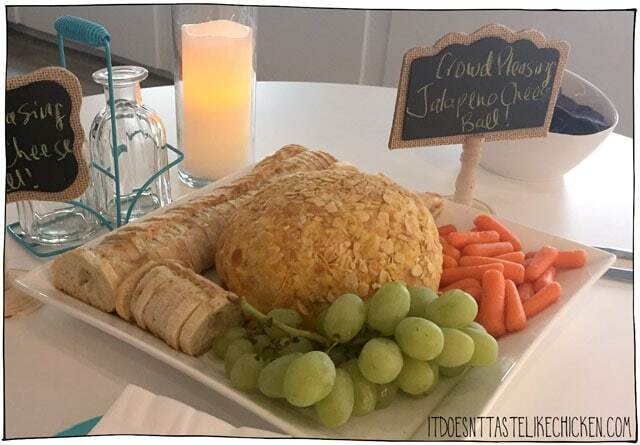 There was nothing wrong with doing it on a plate, it still looked fabulous, but I think for guests I would like to have a big ole bowel. AND as a bonus, I won’t be using my Pyrex bowls when I get take-out Pho (I do make my own, but sometimes a girl just needs a day off!). That’s fantastic! I somehow ended up with THREE copies. Two people will be getting Christmas gifts this year of vegan delights. Congratulations Sam! I am so so happy for you! 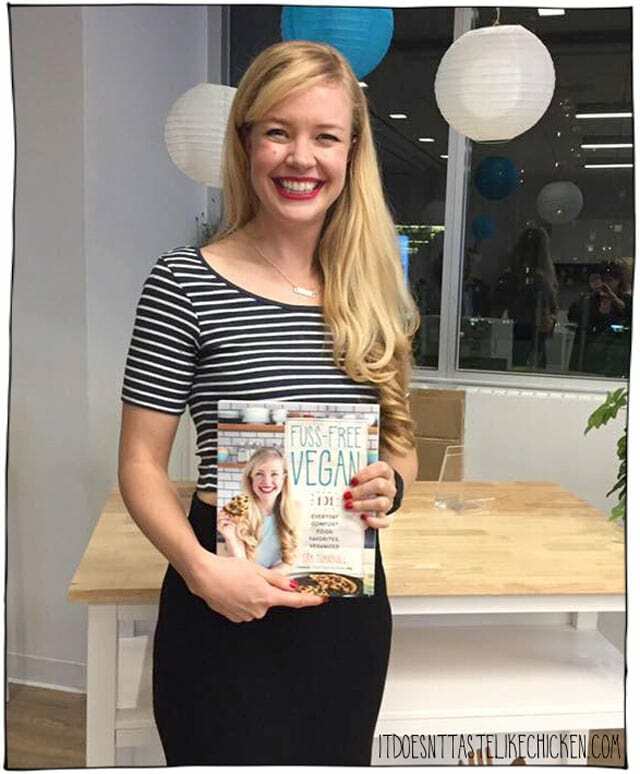 You were one of the very first blogs I followed on my Vegan journey and made me believe I could live this way – pure joy. I haven’t forgotten to illustrate your red pepper “cheese” for TDAC … just way side tracked. I look forward to purchasing and cooking from your book! Best to you! Woohoo!!!! You’re most welcome. 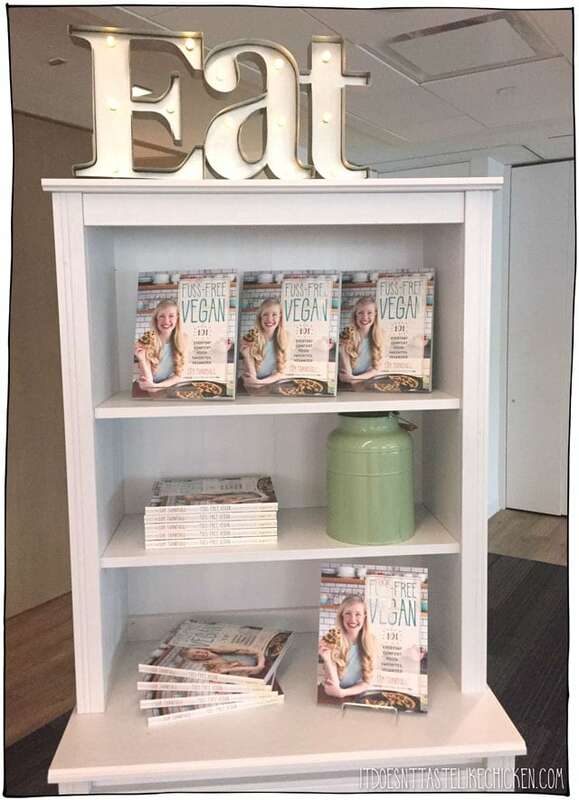 Those cookies were one of the very first recipes I made for the book because they were the first thing I wanted when I went vegan too! Haha. I am going to try and get a copy! I love your recipes by the way. When I get some extra cash I will gladly buy your book! You have made my transition easier and I thank you! 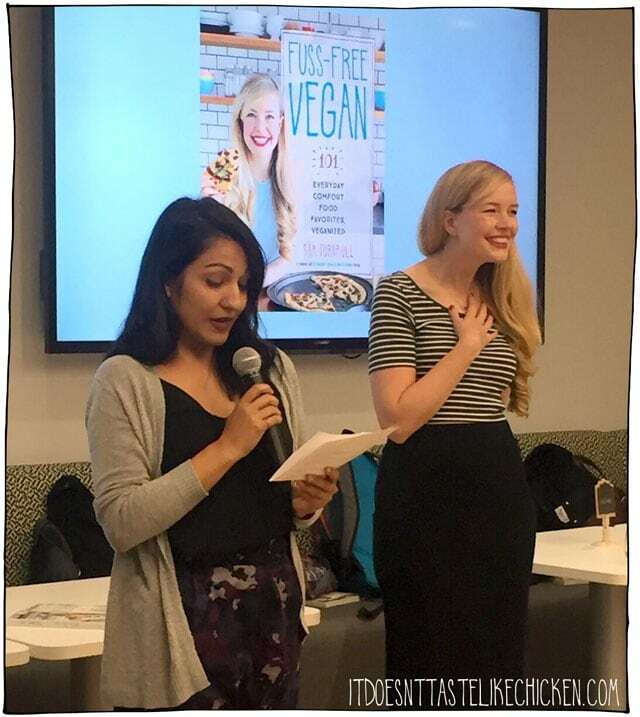 I am incredibly excited to receive my copy of Fuss free vegan, I love your recipes they have helped me to smoothly transition from meat eater to complete vegan and it has been hassle free so thank you. I look forward to watching your career as a cook and writer blossom, you are a superstar! Sam, I so incredibly excited for you right now. Sounds like an incredible evening, and so deserving of such a genuine, funny, sweet and beautiful spirit. It may seem weird to state from a faceless follower, but I’m also so proud of you. Hearty Congratulations on your FISST cookbook and your newfound International fame. Please keep giving us those wonderful healthy recipes and enjoy all the Hoopla going on in your life. Don’t lose your charming way, and do begin collecting for book #2. Hahahaha! Thank you so much, Sandra! I can’t even fathom wrapping my mind around a second book right now, but maybe in the future. For now, I am looking forward to sitting back with a nice glass of champagne and finally putting my feet up for a minute. 🙂 Thank you for your kind words, Sandra! I’m so excited for you. I have told just about every employee in the hospital at work all about you and your blog and book. I really hope a major food network picks you up for a televised show, as Vegan cooking shows are sorely missing from their lineups. You go girl!!!! Hahahaha, that’s awesome! Thank you for sharing my blog around, Marian 🙂 OMG! Yes, we are in need of a good vegan cooking show, that would be SO much fun! Hi Sam! Congratulations on the release of your new book, it’s going to be a hit. With your talent and your adorableness, not to mention your crazy sense of humour you will go far. Thank you from the bottom of my heart for helping me through the recovery of my knee replacement surgery. Without your recipes I wouldn’t have made it. You are just adorable! I’m so excited to get your book…Amazon says it’s on its way! Thanks for sharing your incredible talent with the rest of us! Congrats. You are just beaming!!!! Thank you for sharing this special time with us. Hi Sam. I just wanted to say how proud I am of you and I can’t wait to get my personal copy of your cookbook. Keep doing what you are doing. It’s great ! Thank you so much, Colleen 🙂 I hope you love the book when you get it! My book arrives Tuesday! I’m so excited.